Pearl Harbor propelled the United States into World War II, but many Americans saw the AXIS threat long before Dec. 7, 1941. Among them were nearly 150,000 men and women involved in aviation. As early as 1938, they began to argue for the creation of an organization to harness their aviation resources to aid the nation in the event America entered the conflict. Their efforts, led by writer-aviator Gill Robb Wilson and supported by Gen. Henry "Hap" Arnold, resulted in the creation of the Civil Air Patrol on Dec. 1, 1941 - one week before Pearl Harbor. First organized under the Office of Civilian Defense, headed by former New York Mayor Fiorello LaGuardia, Civil Air Patrol members became the "Minutemen" of World War II, volunteering their time, resources, and talents to defend the nation's borders and fill the gaps as men and resources were being mobilized to fight abroad. The War Department, especially the Army Air Forces, recognized the important roles performed by CAP. 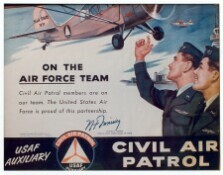 In April 1943, CAP was reassigned from the Office of Civilian Defense to the War Department and placed under the jurisdiction of the Army Air Forces. 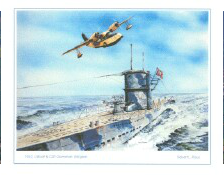 "After the German surrender, one of Hitler's high-ranking naval officers was asked why the Nazi U-boats had been withdrawn from U.S. coastal waters early in 1943. The answer was exploded in a curt guttural: 'It was because of those damned little red and yellow planes!'" -- From Robert E. Neprud's Flying Minute Men These Flying Minutemen, all volunteers, performed valiantly during the war. 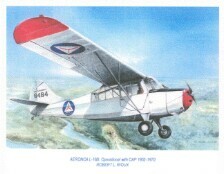 They performed many missions including coastal patrol to search for enemy submarines, search and rescue missions throughout the United States, cargo and courier flights to transfer critical materials and personnel, and even towing targets so Army Air Corps personnel could practice air-to-air gunnery techniques - a very risky mission with new gunners. In all, these volunteers amassed a stunning record - flying more than half-a-million hours, sinking two enemy submarines, and saving hundreds of crash victims. A thankful nation recognized the vital role CAP played during the war and understood the organization could continue to provide invaluable help to both local and national agencies. On July 1, 1946, President Harry Truman signed Public Law 476 that incorporated CAP as a benevolent, nonprofit organization. And on May 26, 1948, Congress passed Public Law 557 which permanently established CAP as the Auxiliary of the new U.S. Air Force. This law also gave the Secretary of the Air Force the authority to provide financial and material assistance to the organization.